Here is a video I put together of how to make Cake Pops. Really the beginning part is how to do a basic cake pop, I just gave it S'mores flare, so skip the marshmallow and graham cracker coating if you only want to know to make the cake pop only. Now go impress some friends and make some cake pops! Last weekend we packed up the kids and the car and hit the road towards Sequoia. It's the first of many trips we're taking this summer and the kids did great and had a blast and said they would sit in the car again to have a trip like that. I consider that a success! It started Friday, we wanted to leave after morning traffic but before afternoon traffic, which gives us exactly 2 hours to leave, haha, just kidding, it's not that bad, but it feels like it sometimes. We left at 10:40, in case you wanted to know. What we do almost every trip we take, stop at In and Out, it really wouldn't be a trip without a stop. We got to Sequoia around 4pm and decided instead of hanging out a subpair hotel that we would just go into the park. We stayed just outside of Sequoia so we decided might as well take advantage of the 3 hours of daylight and head on in. We gave Baby Fox an iPad for his 5th birthday, we were letting Mini Fox use Mr.'s iPad for the trip. We told them that they are only allowed to have them in car rides over 5 hours, and even then they can really only have them for the second half of a trip. So after lunch we finally let the kids have the iPads, they were excited, but to their credit, never asked for them because we had told them they weren't allowed to have them until after lunch. She informed us that this Christmas hat was her hiking hat. We went for a small walk down this path and found a really cool alcove with a really pretty waterfall. and a small space for the kids to play around in. Started off just walking around. And turned into swimming...haha, oops! She built a rock tower, she wanted a picture next to it. We stopped at this place for dinner, my Dad calls Baby Fox Buckaroo, w thought it was fitting to eat here and take a picture. If you are even in Three Rivers, a must place to eat, SOOO good, you can eat outside over looking the river and there are toys for the kids to play with. Get the grilled cheese, amazing. When we sat down everyone was so done of me taking pictures...and they were hungry. After pleading with them, I just joined in, Mr. thought it was hilarious no one was cooperating. And what a family selfie without a little zombie action? The kids got to sleep in the same bed for the first time and thought it was the coolest thing EVER! They hide under the covers when they were suppose to be sleeping and were whispering to each other, like we couldn't hear...haha. Saturaday we were up bright and early so we could get into the park and get through the construction, they said the wait could be up to 3 hours, so we figured that the earlier we started the better off we would be, since most people probably didn't stay right outside of the park, ended up on the weekends they don't work, so it wasn't going to be too bad. We were the first car at the stop, and only had to wait 10 minutes. It was down to one lane, so we were waiting for all of the cars to come down. I got out and took a picture of course. First stop was at the vistors center and the first place we could park. We heard that parking could be tough so we wanted to just find a spot and park. Good thing we did because parking was crazy up there. Turns out there is also a bus system that takes you between the popular spots. So it ended up working out really well. Did I tell you my brother also drove 6 hours to come hang out with us? The kids LOVED having him there. We saw that this hike was paved, so thought that was a good starting place. 20 feet in we saw this unpaved path and thought, hey let's go here instead. We ended up having to ditch the stroller at some fallen trees and shimmy our way under the tree. She pretty much held my brother's hand the whole time it was super cute. After that we took a bus to General Sherman. The boys got distracted doing this. General Sherman, biggest tree in the world. Then we took another bus to grab some food. Turns out I left my sunglasses on the roof of my car when I went to get the stroller. Still sitting there 4 hours later. People are so honest. Or they didn't see them, in any case, glad I didn't lose them. Dirty car I know. After that we decided to make our way to Kings Canyon National Park, where our second hotel was. It was a little over an hour away. We lost my brother due to a gas station thing, but finally found him about 2 hours later, we all checked in and then decided we would take advantage of the light and do one more thing. So of course we hit up General Grant. Original ranger house. It's hard to describe how big these trees really are. As you can see the cars are super small compared to them. If you ever have a chance, you should go. We stayed at the John Muir Lodge in Kings Canyon and it was great! We were all pooped after all that hiking and touring around. We layed on the bed and watched shark week until it was time for bed. The next morning this girl did not want to wake up, but we had to get going, finally at 8am we woke her up and she just wasn't having it...we are going to be in trouble when she gets older! The ladies over at The Blended Blog have created a super easy Monday morning post the first Monday of the month. It's called TBBAsks...where we ask a bunch of random questions and then you answer. 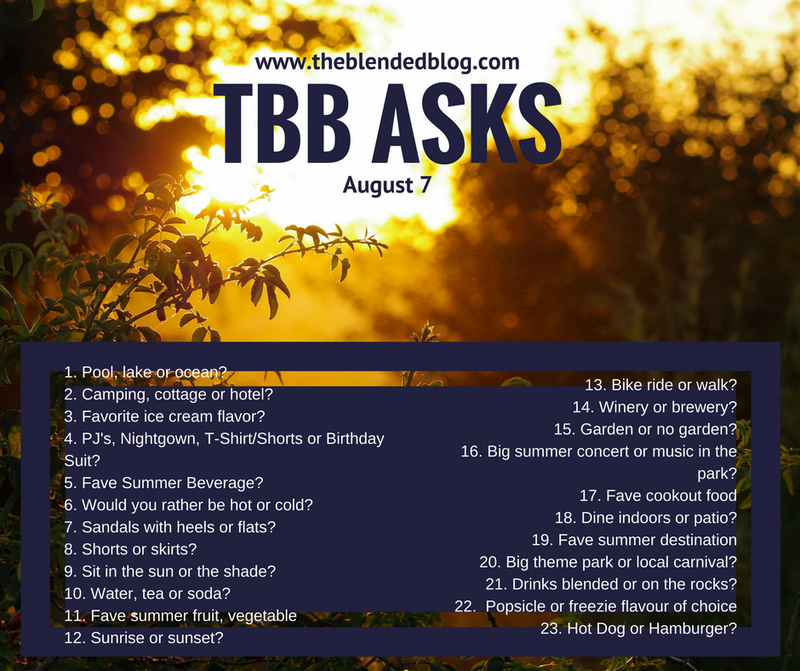 What better way to have an easy post, answer some fun questions for your readers. Here is the list of this months questions, to be posted on Monday August 7th. Come link up with us! Felicia from The Starving Chef, just came out with a Harry Potter Inspired treat and her video of the recipe is just so cute, I had to share! Plus how good does that treat look? Yum! Have you heard about the new show The Sinner? Holy cow, I actually watched an ad before a youtube video and was totally hooked. I can't wait to watch it. But knowing Mr. we'll have to wait till all of the episodes air before we can start watching it. The reason I know I'm going to like this show, it's only 8 episodes, and we get an ending, the.end. I told my parents to tape it, so we can talk about it when we see them next. One last thing, have you heard of Tailwind? It's a scheduling tool for Pinterest. It's actually pretty cool, unfortunately it isn't free, but I have gotten a lot of traffic because of it. Anyway, someone in another group was asking about a good Tribe, and no one had, so I suggested we start our own mom's one, and people seemed interested, so I'm starting up a group! I'm calling it Lift Each Other Up, because we as bloggers should do just that, pin each others pin and get it seen! If you want to join click here. Tailwind makes this an affiliate link, sorry about that. But if you do join Tailwind, using this link you get the first month free, which is a $15 monthly cost to try out. So that's cool, try it out for free, if you like it, keep using it, if not, ditch it! What are you up to this weekend? I think we're going to go on something called a Fairy Trail Hike, where someone has put fairy gardens all along this hiking trail for kids to find. How cute is that?